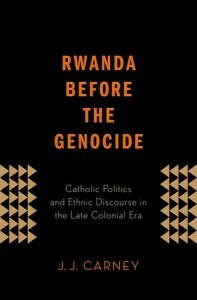 Review of J. J. Carney, Rwanda Before the Genocide: Catholic Politics and Ethnic Discourse in the Late Colonial Era (New York: Oxford University Press 2014), Xi + 343 Pp., ISBN 978-0-19-998227-1. Much attention has been paid by contemporary church historians to questions of complicity of the German churches during the 1930s and 1940s and to theological responses to racist Nazi ideology that led to the genocidal murder of European Jews. 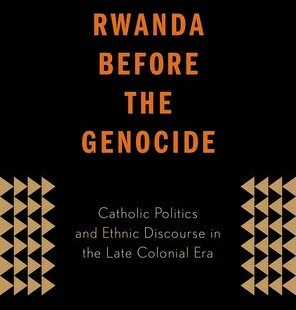 Now J. J. Carney is shifting our focus to a similar set of questions regarding the role of the Catholic Church in Rwanda, asking how certain patterns of ethnic discourse and late-colonial missionizing efforts exacerbated the Hutu-Tutsi divide that culminated in the 100-day slaughter of an estimated 800,000 Tutsi and moderate Hutu in 1994. “One of the most Catholic countries in Africa suffered the worst genocide of the late twentieth century,” Carney writes in the opening lines of his fine study. “Christians slaughtered Christians in Christian schools and parishes” (p. 1). What accounts for the failure of the church to uphold unity among Christians? How did clergy and missionaries contribute to dividing the banyarwanda (Rwanda people) along the lines of politically contested labels of ethnicity? After the genocide, Cardinal Roger Etchegaray asked church leaders in Rwanda if “the blood of tribalism proved deeper than the waters of baptism”—a question that seems to speak deeply to Carney’s investigation of the role of the church. Carney quotes it both in the Introduction and the Epilogue (pp. 2, 207), though not in support of the idea of “tribalism.” On the contrary, he argues that the Hutu-Tutsi division was mobilized ideologically for defining Rwanda’s national independence from colonialism. As a historian, however, he wonders why people of the same faith ended up slaughtering each other. As a matter of fact, whereas Catholic parishes served as sanctuaries during anti-Tutsi violence in the years 1959 to 1964, this protection utterly failed in 1994, when “more Tutsi died in churches than anywhere else” (p. 197). An estimated 75,000 were slaughtered in the Kabgayi parish alone, the center of Catholic life since the early twentieth century. Throughout Rwanda, more than 200 priests and people from religious orders (mostly Tutsi) were killed, while other priests actively endorsed or supported the interahamwe militias, like diocesan priest Fr. Athanase Seromba, who burned down a church with 2,000 Tutsi inside (p. 308, n.124). How can we account for the dramatic shift from Catholic sanctuary to mortuary? As the book’s title indicates, Carney does not focus on the1994 genocide itself but investigates Catholic Church politics in early decades, especially in the 1950s and early 1960s. Carney identifies this period as essential for setting up patterns that later get utilized and mobilized in the genocide. He carefully avoids pronouncing a sweeping judgment that either blames or exonerates the church. He also does not pursue a deterministic view of history: the patterns he identifies contributing to the increasingly hostile rift between Hutu and Tutsi do not point to a predictable (and therefore preventable) future genocidal outcome. Carney presents a nuanced picture of multifarious voices within the Catholic Church. Situated between, on the one hand, the church’s alliance with the Rwandan nobility and Tutsi elites dating back to successful early missionary efforts and, on the other hand, its growing support of social reform politics in the 1950s in favor of impoverished peasants (largely, but not exclusively Hutu), missionary and church leaders presented varying explanations for the woes plaguing Rwanda’s social and political landscape. Despite advocating unity in the church and condemning the sporadic pre-1994 violence, many of these leaders nevertheless actively participated in an ethno-political and national-reform discourse that, at least in retrospect, aggravated the conflict. Carney suggests revising the standard explanation of the complicity of the churches. He distances himself from the more popular view of a “primordial tribal hatred between Hutu and Tutsi” ( p. 2) as well as from majority scholarly explanations that argue that colonial officials and Catholic missionaries taught Hutu and Tutsi “to see each other as separate racial groups” (p. 2). Whereas the former view has been debunked as a colonialist narrative, the latter simplifies complex historical developments and reduces the Rwandan people to puppets of colonial powers, thereby denying them active political agency. Carney also notes that current scholarship on Rwanda’s church history does not pay attention to the important decades of the 1950s and 1960s. According to Carney, the standard narrative correctly points to the missionary alliance with the Tutsi elite before the 1940s, but “then skips to the 1980s and 1990s” (p. 2), when the church had already realigned itself with the Parmehutu, the Hutu national party that assumed political power. Before the outbreak of genocide in 1994, the church had formed close ties to Hutu President Habyarimana and Hutu Archbishop Vincent Nsengiyumva. This standard narrative, according to Carney, is present in the works of Mahmood Mamdani (When Victims Become Killers: Colonialism, Nativism, and the Genocide in Rwanda, 2001) and Timothy Longman (Christianity and Genocide in Rwanda, 2010). Carney does not dispute their observation that institutional church interests contributed to the entrenchment of ethnic labeling, but he suggests that the 1950s have been largely neglected, although they were crucial to the politicization of ethnicity. It was in the 1950s, Carney argues, that all other identities (such as clan, patron-client, religious) were “subsumed under the Hutu-Tutsi dynamic” (p. 3); it was also in the 1950s when major players in the Catholic Church and European missions shifted their sympathies to Hutu social reform ideas that advocated a “more egalitarian Rwanda society marked by social justice, democracy, and economic equality” (p. 3). The shift of church politics from pre-1940 alliance with Tutsi elites to post-1950s Hutu sympathies (and subsequent close church-state relations to the Hutu political regime, first under President Kayibanda, then Habyarimana) deserves close attention, as Carney persuasively argues. This shift, however, seems contradictory, given the old colonial race theory as articulated in the Hamitic thesis. The Hamitic thesis perceived Tutsi as racially superior. Based on the biblical curse of Ham (Genesis 9), combined with nineteenth century race theories, European missionaries and colonial explorers considered the Tutsi as civilizers of the Bantu African population, the Hutu. Europeans felt an affinity to the Tutsi, described by some as “Caucasians under a black skin” (p. 11), ignoring the fact that social class divisions crisscrossed the Hutu-Tutsi difference (since many Tutsi belonged to the landless peasantry as well). According to the Hamitic thesis, the missionaries should have kept their loyalty with the Tutsi. But this is not what happened. Early missionaries actually poured their conversion efforts into the landless class—the disempowered, largely Hutu peasants, who, in turn, hoped that the Europeans would advocate on their behalf against their mostly Tutsi patrons. Yet, the missionaries did not succeed with their conversion program until the Tutsi king Mwami Musinga allowed them to establish missions in central Rwanda, like the above-mentioned Kabgayi. It eventually led to la tornade, a French term for mass conversions of mostly Tutsi in the 1930s, and to the establishment of Rwanda as a “Christian kingdom” in the 1940s. The White Fathers, a French missionary order, played a crucial role in these developments. Carney’s study presents several leading figures among the White Fathers and analyzes their writings with respect to political and ethnic rhetoric. For example, Charles Lavigerie, the earlier visionary of the White Fathers in the 1880s, advocated that missionaries sent to Africa were to adopt indigenous customs and languages. His motto: “to the weak I became weak, to win over the weak” (1 Cor 9:22). Yet, Lavigerie also insisted on a model of top-down evangelization, a preference continued by Mgr. Léon Classe, another influential White Father, who therefore allied himself with the royal court of Mwami Musanga. By all accounts, this strategic choice paid off: by the 1940s, Rwanda had become a majority Catholic country. In the 1950s, however, those sympathies began to shift toward the Hutu cause of social reform, and here the decisive role fell to White Father André Perraudin. Fearing communism and secularism more than anything, Perraudin and other White Fathers embraced Catholic social teachings (based on the 1891 encyclical Rerum Novarum) with which they sought to stem communist ideas. They advocated abolishing traditional feudal systems, like the ubuhake, in favor of Western economic and democratic policies. The ubuhake bound a landless client population to the protection of their mostly Tutsi patrons. In the early 1950s, White Fathers and Hutu leaders shared visions of a pan-ethnic, democratically reformed nation that would lead to equality among the banyarwanda and neutralize of what was feared as a godless communist revolution. Strangely—at least in retrospect—the Tutsi nationalist party UNAR (Union Nationale Rwandaise, formed in 1959), with its strong anti-colonial and anti-missionary rhetoric, was condemned as communist. These contextualizing historical developments are covered in the first three chapters, setting the stage for the years 1956-1962, which are at the heart of Carney’s analysis. Chapter 4 looks at the period of 1956-1959, in which tensions between Hutu and Tutsi grew due to the political mobilization of ethnic divisions. Chapter 5 covers the period of 1959-1962, when the Tutsi monarchy was replaced by a democratic republic. De facto, however, this republic was a Hutu dominated one-party state, leading to the first waves of severe anti-Tutsi violence and expulsions. In these two central chapters, Carney proves himself a prudent observer who skillfully weaves together material from an abundance of primary sources. I limit myself here to three salient points. First, Carney repeatedly refers to the role of the évolués, the indigenous African elite trained in European-style missionary schools and seminaries. The évolués are conceptually important for Carney’s study because they validate the role of indigenous Africans as major political agents (over against a simplified thesis of an all-powerful European dominance). The évolués are historically important since both Hutu and Tutsi students were groomed in the seminaries. Yet, instead of building a cohort ensuring the unity of the Christian church, they became leaders in separate and later antagonistic organizations, like the Parmehutu and UNAR. Some of the leaders became the first indigenous African priests and bishops in the then Belgian colony; other turned to secular politics. In either case, personal ties forged in the seminaries often extended into later political loyalties in church-state relations. Second, Carney weaves into his historical analysis a comparison between two key figures, Aloys Bigirumwami, the first indigenous bishop in Belgian Africa, and André Perraudin, a Swiss White Father and Archbishop of Kabgayi from 1956 to 1989. These two men became protagonists in the church’s struggle, personifying two different perspectives as to the cause of, and remedy for, Rwanda’s increasing ethnic-sectarian discourse. Bigirumwami, from a mixed Hutu-Tutsi background, had been seen at his time as a conservative leaning bishop not swept up in the promotion of Catholic social teachings in support of the Hutu social reform movement. Instead, he incessantly cautioned “against the darker side of these movements” (p. 123), perceiving the real danger not coming from traditional feudalism or modern communism but from violence lurking in Rwanda’s growing ethnicism. Perraudin, in contrast, kept pushing the social reform agenda and aligned himself with the Hutu cause (and later with the Hutu one-party state). Though both Perraudin and Bigirumwami issued joint pastoral letters against the violence they witnessed, they had strikingly different views of the events. Perraudin kept downplaying the anti-Tutsi violence, justifying it as an understandable outburst of Hutu anger. As late as June of 1994, Perraudin, from his retirement home in Switzerland, laid blame for the genocide on the RPF, the Tutsi Rwanda Patriotic Front, that ended the genocide in July of 1994. Bigirumwami, for his part, was replaced in 1974 by Hutu bishop Vincent Nsengiyumva, who two years later became Archbishop of Kigali, with close ties to President Habyarimana’s government. Here, Carney allows himself an ethical judgment, articulating his frustration with Perraudin’s unwavering “air of self-righteousness” (pp. 200-01), while repeatedly calling Bigirumwami a lone prophetic voice. Bigirumwami, Carney laments, has been all but forgotten in the standard narrative, but he wants to rescue him from oblivion. Third, Carney’s study teaches us to be careful about the abuse of a one-sided partisanship regarding social movements. Carney makes clear that the Hutu sympathies espoused by Perraudin and others were not rooted in liberation theology but rather in the conservative form of Rerum Novarum. He criticizes Perraudin’s church politics as a short-sighted support for the impoverished Hutu majority, falling prey to the “political instrumentalization of ethnic identities” (p. 206). Carney coins the term “analytical partisanship” to describe Perraudin’s ill-guided support of Parmehutu’s politics, preventing this churchman from naming accurately the “link between ethnicism and political violence” (p. 173). In chapter 6, Carney presents, in quick strokes, developments after 1962, especially the escalating anti-Tutsi violence of 1963-1964 and 1973 as well as the 1972 genocide in neighboring Burundi, where a Tutsi government killed an estimated 200,000 Burundians—all leading up to the 1994 carnage. As important as these developments are, Carney makes a good choice by keeping his focus on the neglected 1950s and early 1960s—a choice partially driven by pragmatic reasons, as he explains in a footnote: the archives he consulted in Rome and Rwanda had restricted his access to materials after 1962 (p. 306, n.2). In an eight-page epilogue, Carney ventures briefly into theological territory, drawing out some lessons for church and theology. Among others, he mentions the lack of “prophetic distance” to state power as main reason of the church’s complicity—surely a lesson learned from Bigirumwami’s lone prophetic voice; a lesson also, I might add, for many conflict zones today.